Witches are trying to conquer Hazewich, and threatening secrets from the past keep surfacing! If that weren’t enough, demons walk right by you, and scary symbols keep appearing in the morgue following enigmatic murders. Are you ready to confront the overwhelming evil to save your old town … and maybe the whole world? Seven years have passed since your parents Audrey and Patrick went missing and you left Hazewich. When your granddad asks you to come back urgently, it’s clear that strange things are happening again. No one meets you at the station upon arrival, the town and its people are gloomily silent, electricity goes out for no reason and windows are framed with strange datura plants. Worse, there is no return date on your ticket! Are you doomed to stay here forever? Is this world even real? And could this all be related to the mysterious Mirror of Avatifa that broke many years ago? Meet lovely Amanda living next door and fight the devilry together. Wander the desolate streets and rid Hazewich of the spooky forces that are trying to destroy your world! 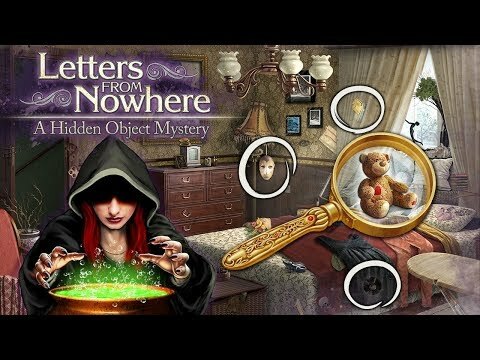 Letters From Nowhere®: A Hidden Object Mystery © 2011 - 2019 Awem Games®. Published by G5 Entertainment AB.